There are many reasons that you may want to gain the trust of a feral cat, but the process is not as easy as you may think. Before proceeding, you should be aware of the high probability that your feline friend will never allow you to touch it. These animals are not quick to trust, so you will need to be very patient in order to succeed in bonding with them. First, let’s clarify exactly what we mean when we refer to cats as “feral”. This designation is often confused with “stray”, but the two terms are very different. A stray is simply a domesticated cat that has become separated from its home for one reason or another. A feral cat, conversely, looks just like a domestic cat, but has not experienced human contact. Its behavior will be similar to that of a raccoon or other wildlife. Aside from behavior differences, you may be able to identify a cat as a pet if you see a collar or a well-groomed coat. Feral cats, on the other hand, can sometimes be identified by a missing sliver of ear. The “tipped” ear indicates that the cat has been spayed or neutered by a volunteer group, then released. Before attempting to befriend a feral cat, be sure that you understand what you’re getting yourself into. You should be aware of some potential problems and risks associated with welcoming an untamed animal onto your property. Just like any wild animal, feral cats will defend themselves if cornered. Moving too quickly with one of these cats could result in being scratched or bitten. Wounds from cats often become infected, hence the term “cat scratch fever”. Stray and feral cats may carry a disease called Feline Leukemia Virus. This fatal disease cannot be detected by sight and is contagious to non-vaccinated cats. Feral cats may also become territorial over their newfound retreat, and urinate, scratch vertical markers, or even chase away “intruders” as a result. Now that you’re aware of the dangers of cozying up to a feral cat, it’s time to get to work. The first step is to create a place that will seem attractive to a feline friend. Feral cats are focused on survival, so they will surely seek out food, water and shelter. Choose an area within your property that will serve as your hangout spot. This needs to be a quiet space that you can monitor from inside your home. You’ll need to be able to spend hours at a time in this spot, so comfortable outdoor furniture or a camping chair is a plus. Whatever the item is, it should be introduced to the area from the beginning. Start leaving food and water in your designated area while no one is home, at least 50 feet away from the door (and your chosen seat) if possible. While dry cat food will often do the trick, you may want to consider a more fragrant food to attract cats more quickly. Some feline favorites include canned cat food, baby food, canned tuna in oil, sardines, and of course, catnip. Once the cat smells food and realizes that the coast is clear of predators, he will most likely drop by for a bite. This will put your house “on the map”, and in Kitty’s daily routine. Keep in mind that by leaving food out unattended, you could attract other wildlife that may not be so desirable. Continue to leave food out for the cat for 3 to 4 days, allowing him/her to acclimate to the space with no human interference. After this time is up, you can add yourself into the equation. Begin putting food out only while you are home, but inside, so that the cat can smell you. After allowing the cat to eat with you on the other side of the door for a few days, try doing the same, but with only your screen door (weather permitting) separating you from the cat. If the cat appears to accept this routine, it is time to sit outside while he eats. Don’t be surprised if the cat doesn’t show up for food on this day- he is unsure of your intentions and is probably watching from a distance. The key is to be patient. Spend a few hours in the chosen area, doing your best to look non-threatening. This means that you should be still and quiet, even if you don’t see the cat. It’s also very important that you do not go looking for it at this point. All you’ll do is scare it. After a few days of this routine, your feral friend should gain some confidence. If he does approach the food with you in the area, you’re doing a great job! If and when the cat approaches, you’ll want to continue exactly as you were, almost as if you don’t see him. This shows the cat that you aren’t a threat. For each of these steps, you must settle into your space before the cat arrives, and remain there until he leaves. Any movement can scare your new pal away for good. You should only move the bowl closer every few days if the most recent progress has been accepted. If the cat stops showing up, or is visibly afraid, slow the process down until he seems comfortable. Follow this pattern until the cat reaches 10 or so feet from your chosen sitting area. If, at any point, you don’t see your feline friend for a couple days, withholding food for up to 48 hours may leave him desperate enough to give you another chance. You shouldn’t let him go hungry any longer, nor should you ever withhold water, as this may cause Fluffy to look elsewhere. Once you’ve gotten into the routine of sharing space with the cat, the best way to improve the relationship is to understand body language. 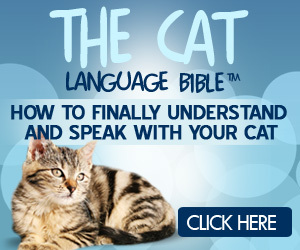 There are plenty of resources on cat communication, focused primarily on eye, ear, and tail movement. You can even try to communicate trustworthiness to your kitty companion by slowly blinking at him. In the cat world, this is a way of acknowledging an acquaintance while expressing that you are not a threat. Many feral cats will not let their human caregivers get within reach of them, even after months of companionship. This does not mean that they do not share a special relationship. You may continue to bond with your feral friend for years to come by simply enjoying each other’s company. Some cats may even play with a laser pointer- just be sure not to move too quickly! Bonding with a feral cat can be extremely rewarding. Earning the trust of a wild animal is an honor that not many people have had the fortune to experience. The process can be tedious and frustrating, but with an abundance of patience and understanding, you can do it! Having a pet is one of life’s greatest joys, but your belongings can sustain damage from sharing your home with a cat. Many pet owners even become accustomed to the smell of their own home, and don’t notice the same scent that is offensive to their guests. If you’re a cat owner, it’s important to know how to get rid of urine stains and odors before they start to impact your personal life. Before you can find the best way to remove stains and odors, you’ve got to know what kind of mess you’re dealing with. Is it on fabric or hard wood? Is it a new mess, or has it already dried? We’ll delve into each type of stain and how to best handle them. The easiest mess to handle is one that is machine washable, so we’ll start there. Any sort of fabric, like clothing, sheets or pillowcases can be a target for your cat. If you find that your cat had an accident on your clothes or sheets a few days ago, put the dirtied items in a pile and cover them in baking soda. This will lift some odor by absorption. Next, place the items in the washing machine following normal instructions. In addition to detergent, add two to four cups of white vinegar as well as a scoop of baking soda. Try to keep the load small, so that the items are fully agitated during the wash cycle. For good measure, follow-up with another rinse cycle, using water only. Repeat this cycle as necessary. If you’ve found machine washable items that have been recently urinated on, follow the same instructions, but skip past the initial baking soda step, and right to the washing machine. The less time the items have to soak, the easier it will be to clean. Unfortunately, we aren’t always so lucky as to have our cats pee on machine washable items. If you’re cleaning up a mess on carpet or upholstery, you’ll need to treat the stain by hand. Many cat owners swear by the power of white vinegar and baking soda. If the stain is old, start by sprinkling baking soda on the carpet. If the stain is new, use a clean paper towel to blot away as much of the excess urine as possible. Be careful not to rub it in any further! Next, use a ratio of 3:1, water and white vinegar to saturate the soiled area. Again, use a clean and dry paper towel to blot of excess liquid. Once dry, sprinkle baking soda on top, then vacuum after about 15 minutes. If this is not effective, or if you are one of many who are just as offended by the smell of vinegar as you are of cat urine, try an enzymatic cleaner. Rocco and Roxie Odor and Stain Remover is an affordable and increasingly popular product with pet owners. Like several other popular brands, it uses a particular bacteria to actually break down the ammonia crystals which cause odor. Whichever product you choose, be sure to read the instructions carefully! If you are attempting to remove cat stains and odor from hardwood, the solution is not so easy. It is recommended that you stay away from chemical products for this, as the same compounds that often destroy the odors may also destroy wood. A more gentle solution is to spray a generous amount of 3% hydrogen peroxide solution onto the wood and immediately wipe it. Repeat daily until the problem is resolved. If the scent seems to be set deep into the wood, you may have to resort to sanding and resealing it. Unfortunately, cat owners may experience the horror of smelling urine that they are unable to locate. In this case, you can unleash your inner CSI tech and use a blacklight to find the source of the foul odor. UV blacklight flashlights will help quickly resolve this problem, and can be purchased for as low as $10 on Amazon. Just use the flashlight in a dark room and look for a glowing area. The best way to prevent the accidents and odor from coming right back is to understand why they’re happening in the first place. “Accidents” are typically not at all accidental, but are the result of a behavioral or medical issue that needs to be addressed. If your cat is repeatedly urinating in the same area, especially after the addition of a new family member (human or animal), you are most likely experiencing territorial behavior. Also consider your litter box maintenance habits. If you have recently changed litter type or cleaning habits, your cat may respond negatively. Try reverting back to your last litter brand or cleaning the litter box more often. If your cat is urinating in a variety of spots, you’ll want to get him to the vet as the cause may be health-related. Urinary tract infections are a common cause of urination outside of the litter box. Incontinence is also a possibility, especially as your cat gets older. Hopefully, you do not need to use these tips very often, but when the time comes, use common sense. Make sure that any cleaning products you purchase are safe for your pets and other family members. Try your best to understand your cat’s motivation so that this cleaning process does not become ritual. When cats are in the wild, they usually follow a particular eating habit where they feed on small amounts of food throughout the day. All animals living in the wild believe that food is the ultimate survival resource. When it comes to cats, this fact is evident because they have to hunt in order to feed and live. According to animal experts (who have studied about wild cats for long), these animals feed on a variety of different item depending on the geographical location. With that being said, this post will go ahead to highlight what cats eat and drink while in the wild. According to research conducted by scientists who have examined the faces and stomach contents of most wild cats, these feline friends mostly feed on small rodents such as mice, rats, hares and rabbits as well as small birds such as sparrows and robins. According to deeper research, cats also feed on larger prey such as moles, squirrels and bats. When a cat is hunting in the wild, the degree of success is impacted by the level of experience, the body size/mass, the season and the availability of prey. Although this may appear somewhat insignificant, the truth is that most cats feed on insects and reptiles in large quantities in order to get full. Insects such as spiders, grasshoppers, cockroaches and lizards come with essential nutrients that are not found in any cat foods sold locally. Cats are very interesting creatures. Since they’re known to be wild creatures, cats mostly search for water which has accumulated in potholes, manholes and small puddles around the garden. The reason why cats enjoy drinking natural water over “processed” tap water is due to their sensitive sense of smell which detects water preservatives such as chlorine and fluorine. A cat’s sense of smell is 14 times higher than humans meaning the water that seams odorless to us is quite irritating to cats on the other hand. Similar to the rest of the feline family, cats also feed on fresh prey which they’ve hunted by themselves. This principle classifies cats among the cleanest animals in the wild. To add on this, cats usually consume the entire prey they’ve hunted such as skin, feathers, organs and bones. Something else you need to know about the feeding habits of cats in the wild is that they don’t eat plants such as grains, vegetables or fruits. This means that when feeding your cat, you have to avoid adding large amounts of grains and plant substances to their meals. Cats enjoy feeding alone while in the wild. Quite different to how we treat them, cats mostly hunt and feed 10-15 times a day. When it comes to drinking water, cats prefer drinking natural rain water which has accumulated in small pools around the garden. Have you ever wondered if this meow is any different from the last one your cat threw your way? Most cat owners can brag that their pets make so many different sounds depending on occasion and meaning that they could write a book about it. And, while some cats are more vocal than others, it’s a certifiable fact that they have a rich and versatile “manner of speech”. Out of all domestic animals, cats possess the widest range of vocalizations, second only to birds in this regard! So, next time you hear your cat making noises, pay better attention to the nuances of the sounds, because they are not simple noises, but actually clear indications of your cat’s emotional state of mind. Meows – The most common of all cat sounds, meows are a particularity reserved for humans as they are not used by felines to communicate between themselves. Generally used by cats when they desire their owners’ attention, food or for people to open a door for them, meows can also be a sign of loneliness or illness in some cases. It’s very important to observe the tonality and frequency of these sounds. It might be a simple “Hello! Welcome home!”, but it can just as well be a sign of something more serious which would require a trip to the vet. Purr – Rarely will you hear this sound in a conjuncture other than the instances cats are blissful and content. Purring is their way of showing that they are pleased and happy. Every once in a while the reasons might differ and purring is used by cats to comfort themselves when they are lonely or distressed. As long as you pay attention to their posture, you can clearly differentiate between a normal purr and a warning sign. Hiss – Most commonly produced when a cat feels threatened or unhappy with something, hissing is the clear signal that your cat is upset! Whether directed towards your or another animal, your cat is clearly stating his displeasure. Chirps, Trills, and Chirrups – These birdlike sounds are produced by cats when they are excited about something or happy. They can direct them towards you if they want your attention or if they want to show you something they consider important. Chatter – If you hear your cat chattering its teeth while longingly staring out a window at a bird then you can be sure of the fact that your pet is trying to show both its predatory excitement and frustration due to its inability to get to the prize. Scream – People often make terribly loud noises when they fight and cats are no exception to the rule! Usually punctuating a brutal bite or a paw scratch, cats deliberately scream when facing off their foes. All these sounds are essential to better understanding how your cat feels, what it wants or what it intends to do. Body language is important, but cat owners should familiarize themselves with their pets’ “language” if they wish to live in harmony with their furry companions.